Got Grout? 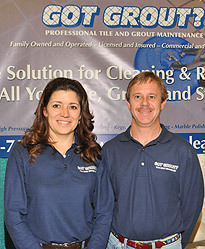 is a family owned and operated business that is licensed and insured to restore and clean hard surfaces (tile and grout, stone, masonry). We use the latest industry technology available on the market to restore the original beauty of your surface. Priding ourselves in professional top notch customer service has built our business to where we are today. We take our time to ensure that we provide the best quality that you will find in the industry, using only the best products so that your surface is restored to the best condition possible. As an owner-operator business we feel it is important to attend training seminars routinely to stay abreast of the most current cleaning, resurfacing, and sealing technologies and products available to give you the best results. We feel its very important to educate our clients about their stone and tile surfaces. As consumers ourselves, every project is looked at from the eyes of the client and what is best solution for the situation.